Ladder Ball is one of the simplest, but most addicting backyard games to play in groups. Best played with 2 or 4 people, win Ladder Ball by hurling bola’s across the yard hoping it will catch and latch around one of the Ladder rungs. Also known as ladder golf, it’s seriously fun! 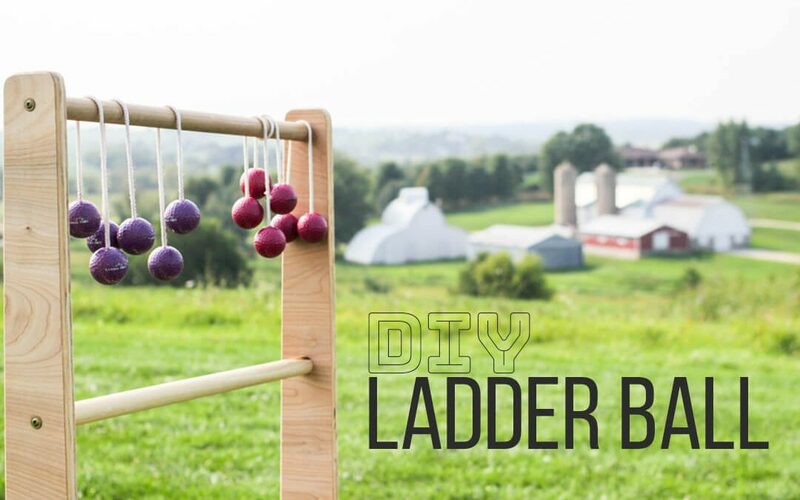 The rules of ladder ball are easy to learn for all ages, but here we are going to cover how you can build your own diy ladder ball game. The 2 most common ways to build your own ladder ball set are with PVC piping or wood. Keep reading for instructions on how to build both types of game sets. Before we start building your Ladder Ball Set, let’s get your game pieces built. In ladder ball the pieces your throw are 2 balls at each end of a string, otherwise referred to as Bola’s. To build your Bola, you will need 12 golf balls, nylon string, and a drill. While playing you want to easily identify each player or team, so make sure the golf balls are in 2 different colors. If you only have white, spray paint the balls in 2 different colors. Step 1: Secure the golf ball in a vice grip. Using your drill, drill all the way through the golf ball, so you have 2 holes at each end. Step 2: Thread your nylon string through the 2 holes of the golf ball. Hint: it’s easier if you use a chopstick or wooden stick to string through. Tie the string at each side of the golf ball tight. Step 3: Repeat step 2 for the 2nd golf ball so you have 2 balls, one at end. Leave approx 12 inches of string in between each ball. Step 4: Singe the ends of the rope with a lighter so the knot doesn’t come undone. Optional: If you don’t have a drill, you can create the Bola’s with Tennis balls instead. Cut a whole in each of the tennis ball with an exacto knife. PVC is the most common material, and the original material the first editions of the ladderball game used. It’s also readily available at any home depot store. The supplies should cost you approximately $20 for the whole set and take approximately an hour to assemble. First we need to cut the 19′ of PVC piping into the correct lengths for assembly. The sizes and instructions below are to assemble 1 Ladder Ball structure, double these instructions to create two. Now that your pieces are cut, let’s assemble them into the pvc T-fittings. You can assemble them and then will fit and stay for now without glue. However given the force of repeatedly having golf balls thrown at the structure it’s recommended that you use pvc cement or glue to assemble. Step 1: Add 3 of the 18″ pieces into a T-fitting. Repeat. Suggested to leave these fittings without glue to that you can dissamble for storage. Step 2: Add a t-fitting to the top of the T structure on each piece you have. Now add a 24 inch piece, the first ladder rung, in between each. Step 3: Add a 18 inch piece to the last spot of the t-fitting. Step 4: Add another 24 piece for the 2nd ladder rung. Attach the 24 inch piece to each of the open t-fittings. Step 5: Add the last 18 inch piece to the empty t-fitting. Step 6: Add the elbows to the top and finish with the last 24 inch piece, completing the 3rd ladder rung. That’s it!! building your own ladderball structure is quite simple and requires very little “handyman” know-how. Keep reading to build a ladder ball game from wood, these instructions are a bit more advanced. PVC piping is the easiest way to assemble a DIY Ladder Ball game set. That said, wood is the most durable set. The biggest complaint with most ladder ball sets, both bought and made yourself, is the durability and that they always come apart. A wood or metal ladder ball game solves this. Metal is quite difficult to make, bu you can find metal sets online. Keep reading for the instructions on how to make a ladder ball game of wood. If you make it out of scrap wood, this will practically be free. Even if you purchase the wood, it should be under $20. Now that we have all of our materials prepped, it’s time to assemble the structure. Step 1: Drill 3 screw sized holes in the 2x4, the first hole is 3 inches from the top. The second is 20 inches from the top, another 20 inches after that, drill the 3rd hole. All the holes should be in the center of the 2x4. Step 2: Hold the dowel up to the 2x4 where there first hole at the top has been drilled. Then from the outside of the 2x4, drill the screw through the 2x4 into the dowel. It’s easy if you have a friend to help hold the pieces together. Repeat step 2 with all the remaining 5 dowels, attached to the 2x4. You will have 3 ladder rungs in total. Last Step 3: Attach the base. Use 2 screws to attach the 2x4’s to the 4 foot 2x2’s.